Sony Corporation ("Sony") and Panasonic Corporation ("Panasonic") today announced that they have formulated "Archival Disc", a new standard for professional-use, next-generation optical discs, with the objective of expanding the market for long-term digital data storage. Vinpower Digital, a recognized global manufacturer and distributor of digital duplication equipment and accessories, has added the prestigious Plextor brand to its arsenal of products. Vinpower partnered with Philips & Lite-On Digital Solutions (PLDS), to distribute the full line of Plextor PX-891SAW Optical Disc Drives (ODD) worldwide. Vinpower's Aero series honored as Best Duplicator in Videomaker's Best Picks 2012. Vinpower's Aero VI is a six-tray, automated duplicator, with capacity for as many as 660 Blu-ray discs, DVDs or CDs. Once a project is set, simply walk away and let it do its thing. Setup and operation is relatively simple, with a fairly intuitive control panel and a (actually) helpful user's manual. Copies are made from a single master, or from multiple masters - without user intervention. For rapid delivery of large quantities of accurately produced discs, Vinpower Robotic Autoloader Aero VI is our BEST Duplicator. 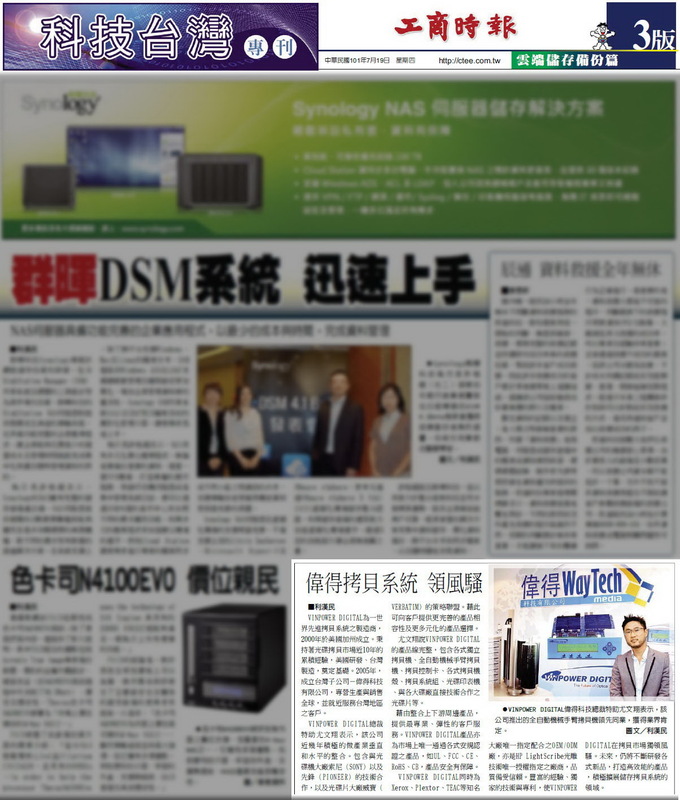 The accompanying image shows a shapshot of the “Commercial times” daily publication in Taiwan (similar to the US Wall Street Journal). 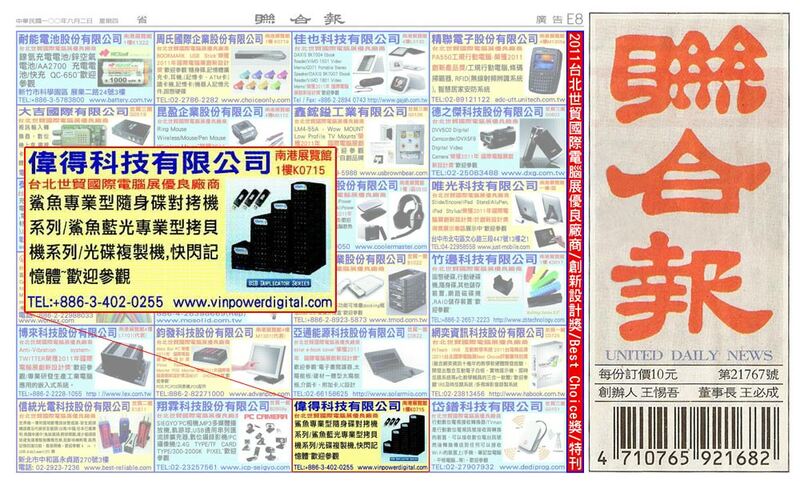 In the article, the interview of Vinpower Digital’s sales Marcio Yu, discusses many items about Vinpower including the inception of the US HQ and Taiwan branch office along with the Companies strategy and how major players in the industry work with Vinpower, such as Sony and Pioneer. Additionally the article touches on Vinpower’s product line and Vinpower’s corporate partners like Xerox, TEAC, Plextor, etc. It was a great honor to be mentioned let alone be embraced with such a positive interview. Videomaker magazine, a popular publication with professional and amateur videographers, released the below review of the Aero VI standalone autoloader duplicator, proclaiming it, “For professional users who need to knock out large quantities of discs in a hurry…”. The availability of Eco Solvent Ink printers is nothing new, but they typically cost many thousands of dollars and tend to be very large complicated machines. The venetian is far more affordable and easy to use in a compact device that can fit nearly anywhere. Videomaker magazine, a popular publication with the professional and amateur videographer, published an article discussing duplication and the companies that support it. The below links show the article in its entirety for your reading pleasure. Vinpower Digital recently exhibited at the 2011 Computex trade show in Taiwan. During our exhibition we garnered a lot of attention from the attendees as well as from the press. The below links show an article written in the United Daily News, dated Thursday, June 2, 2011. The article highlights some of our product information as well as announcing that Vinpower was presented with the Editor's Choice Award.